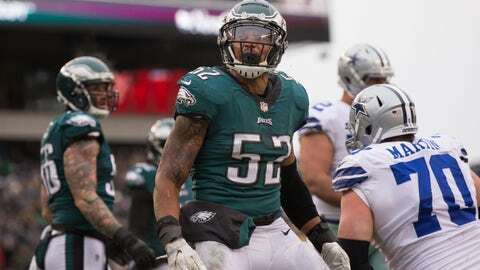 Linebacker Najee Goode (52) spent the last five seasons with the Eagles. INDIANAPOLIS — The Indianapolis Colts found depth at linebacker by singing free agent Najee Goode. Goode spent the last five seasons in Philadelphia and earned a Super Bowl ring on the Eagles‘ championship team. The former West Virginia star was a fifth-round pick of Tampa Bay in 2012 and played his rookie season with the Buccaneers. In 2017, Goode made three of his four career starts and had 19 tackles, three for loss, and 10 tackles on special teams. He has scored two career touchdowns, returning a blocked punt for one. He also scored on a fumble recovery. At 6-foot, 244 pounds, Goode brings another body to a position where the Colts were thin after losing Barkevious Mingo and Jon Bostic in free agency.